Hemodialysis: For patients who require hemodialysis, the mean plasma half-life of acyclovir during hemodialysis is approximately 5 hours. This results in a 60% decrease in plasma concentrations following a 6-hour dialysis period. Therefore, the patientâ€™s dosing schedule should be adjusted so that an additional dose is administered after each dialysis. Acyclovir capsules, USP (white, opaque cap and body) containing 200 mg acyclovir, USP and printed with â€œRX 652â€ on both the cap and the body. Acyclovir tablets, USP (white, oval-shaped, unscored) containing 800 mg acyclovir, USP and debossed with â€œRX 505â€ on one side. 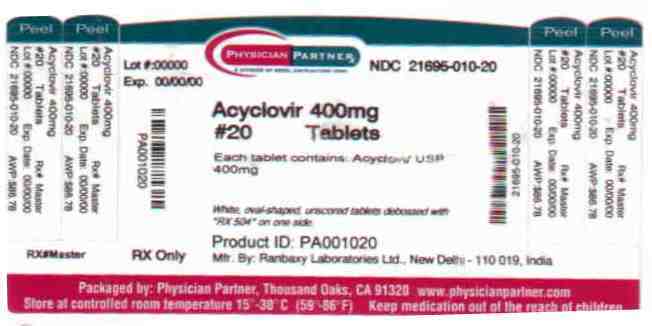 Acyclovir tablets, USP (white, oval-shaped, unscored) containing 400 mg acyclovir, USP and debossed with â€œRX 504â€ on one side. Store at 20 - 25° C (68 - 77° F) [See USP Controlled Room Temperature]. Protect from moisture.